The analysis of engineering failures is an essential part of many engineering curricula today. This focus enables modern engineers and scholars to learn what not to do and how to create designs with a greater chance of success. Key to learning is establishing the nature of each failure—structural, corrosive, electrical, etc.—and understanding that element. 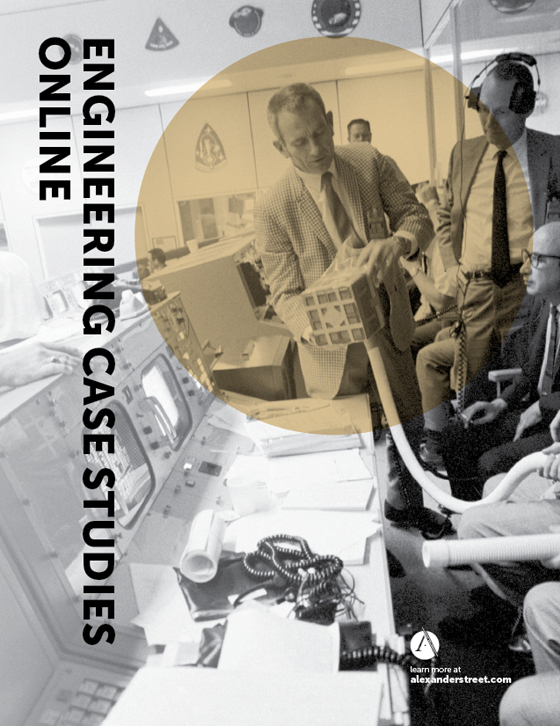 The engineering field needs a comprehensive and authoritative resource to provide in-depth, impartial analysis of key engineering failures. 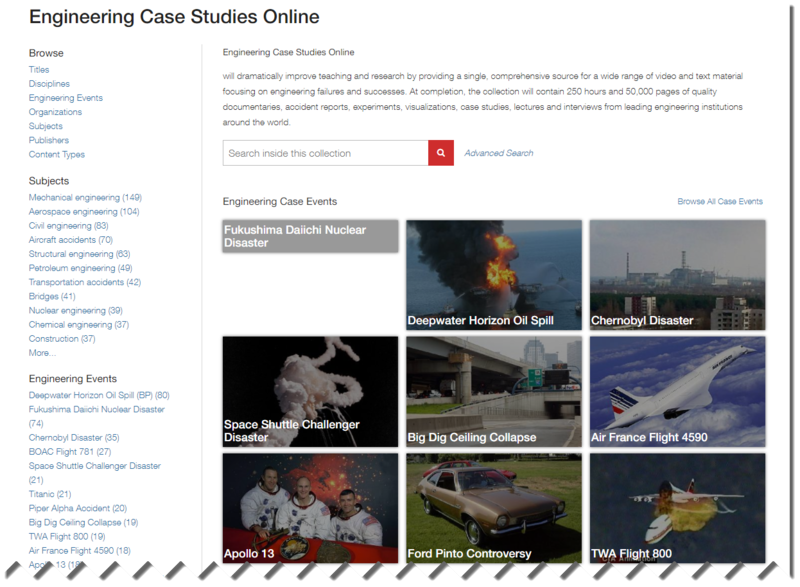 Engineering Case Studies Online is a collection that will grow to include 250 hours of video and 50,000 pages of text resources to meet this need. 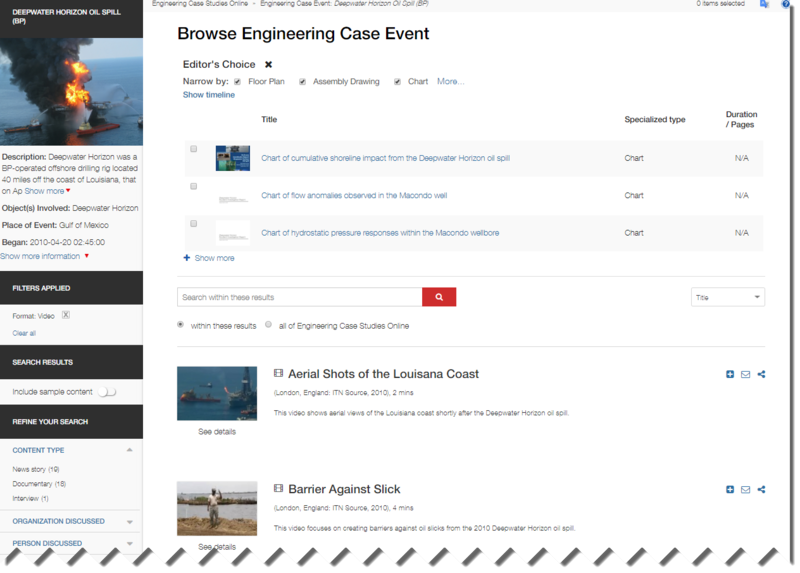 Content is displayed alongside targeted learning objects designed to facilitate detailed understanding of the causes and impact of these failures. Feature-length video documentaries of major failures. Monographs explaining cases in detail and describing key engineering concepts and issues. Simulations depicting precisely what went wrong. Primary footage of accidents, including related news segments. Testimonies from participants, victims, and witnesses. Images, accident reports, blueprints, and other key archival content whenever available. Bibliographies of authoritative materials from newspapers, Web sites, and journals. Specially written cases that explore engineering ethics.